During his introductory press conference with the Oakland Raiders, Antonio Brown says his ultimate goal is to pass Jerry Rice as the NFL's all-time leading receiver. He currently sits No. 28 on the NFL's all-time receptions list with 837 catches. Rice sits first with 1,549 catches. "My goal really is to catch Jerry Rice," Brown said. "Playing with a guy like Coach [Jon] Gruden, obviously, he knows what it takes to keep me upright and fresh. Keep me out there for a long time so it's a challenge every year to prove my love for the game. I'm just taking it one year at a time. The NFL's Final Four for the 2018 season features four of the top-5 offenses in the league, according to Football Outsiders' DVOA. The Kansas City Chiefs rank first, followed by the Los Angeles Rams at No. 2, the New Orleans Saints at No. 4 and the New England Patriots at No. 5. The Patriots defeated the fourth ranked Los Angeles Chargers to reach the AFC Championship. The combined over/under for both Championship Games is the highest in NFL history. 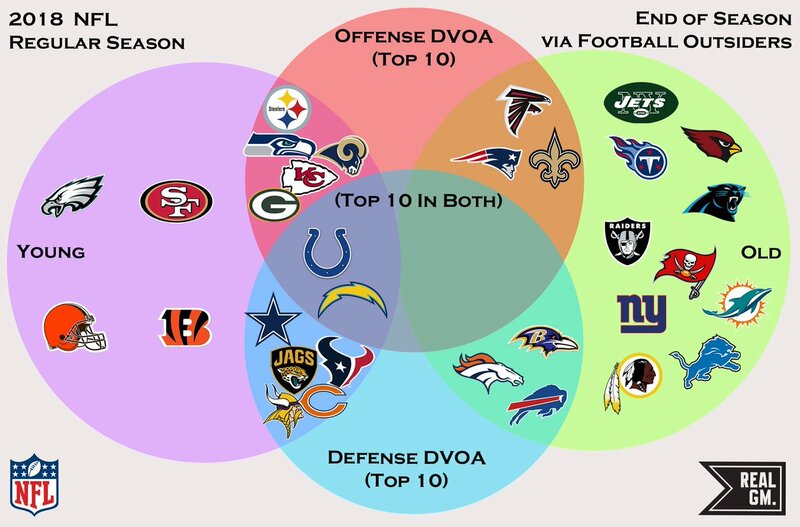 The NFL has just two teams ranking in the top-10 in DVOA on both Offense and Defense at the end of the regular season in the Los Angeles Chargers and Indianapolis Colts. The Chiefs, Steelers, Seahawks, Rams, Packers, Falcons, Patriots and Saints also rank in the top-10 on offense, while the Cowboys, Jaguars, Texans, Bears, Vikings, Broncos, Ravens and Bills are in the top-10 on defense. The Chiefs rank first in the NFL in both Total DVOA and Weighted DVOA. Christian McCaffrey was a true jack-of-all-trades for the Carolina Panthers on Monday night. McCaffrey ran the ball 15 times for 53 yards, he caught eight passes for 67 yards, and he threw a 50-yard touchdown pass on a trick play. He is the first player since Walton Payton (1985) to have 50 or more yards rushing, receiving and passing all in the same game. Lamar Jackson carried the football 18 times on Sunday for 95 yards. Jackson is running the football more than any quarterback, ever. In five starts for the Baltimore Ravens, he has averaged 17.2 rushing attempts. Over the course of an NFL season, no quarterback has ever averaged more than 10.1 rushing attempts per start. In Jackson's starts, the Ravens have 234 runs and 119 passes, a ratio unheard of in today's NFL. Chris Jones tied an NFL record with a sack in his 10th consecutive game Thursday night. The Kansas City Chiefs defensive lineman already holds the NFL's single-season record for consecutive games with a sack. The two other players with a sack in 10 straight games -- DeMarcus Ware and Simon Fletcher -- did so across two seasons. Jones, 24, has 14 total sacks this season. Larry Fitzgerald has passed Jerry Rice for the most catches with one team in NFL history. Fitzgerald has 1,286 catches in his 15 seasons with the Arizona Cardinals. Rice had 1,281 receptions with the San Francisco 49ers. "It's a two-way street in this business," Fitzgerald said. "You have to want to stay in a place and the organization, team, coaches have to want you to be here. It's a two-way street. I'm appreciative of the Bidwill family for giving me the shot to continue to play and call Arizona home. It means a lot to me." Fitzgerald is third on the NFL's all-time receptions list. Rice is first with 1,549 and tight end Tony Gonzalez is second with 1,325. Aaron Rodgers set the NFL record for most consecutive passes thrown without an interception in Sunday's win over the Atlanta Falcons. He tied Tom Brady with 358, then surpassed him in the second half. The Green Bay Packers quarterback finished the game with his streak intact at 368 passes. Rodgers' last interception came in Week 4 against the Buffalo Bills on a twice-deflected pass. He has 23 touchdowns and just one interception this season. He's completing 62% of his passes. If the New York Giants lose on Sunday, Eli Manning will tie Brett Favre for the second-most quarterback losses in NFL history. Manning has 111 loses as New York's starter. Vinny Testaverde holds the dubious mark with 123 defeats. Odell Beckham, Jr. reached the 1,000-yard mark last Sunday for the fourth time in his five-year career. Zach Ertz has 84 catches for 895 yards this season, putting him on pace for a historic season. Michael Thomas has caught 82 of the 91 passes he's been targeted on this season. The Rams and Chiefs set records in a wild 54-51 game on Monday night. Frank Gore has set an NFL record by reaching 500 yards for the 14th straight season. Passing numbers are up across the NFL this season as throwing the football dominates offenses more and more. Drew Brees broke Peyton Manning's all-time passing mark of 71,940 yards in the second quarter of the Saints' 43-19 win over the Redskins on Monday night. Tom Brady became just the third quarterback in NFL history to throw 500 career touchdowns passes in the second half of the Patriots' 38-24 win over the Colts on Thursday night. Only two players have thrown 500 touchdown passes in NFL history, but two more players will join the club very soon. Through three games, Drew Brees has a 80.6% completion rate on his 129 passing attempts. Through three games, Michael Thomas has 38 catches for 398 yards. Drew Brees is also on track to set the record for career passing yards within the next few weeks. The Ravens have set an NFL record with touchdowns on each of their first 12 trips into the red zone this season. Kerryon Johnson rushed for 101 yards in the Lions' win over the Patriots on Sunday night, breaking a streak that dated back to 2013. Phillip Lindsay set an NFL record on Sunday, becoming the first undrafted free agent ever with 100-plus scrimmage yards in each of his first two games. Adrian Peterson rushed for 96 yards and a touchdown on 26 carries. Washington was pretty good but not great during the Kirk Cousins era and enter 2018 optimistic about Alex Smith. The Titans have largely been stuck in the bottom half of the NFL since their 13-3 season in 2008, but they reached the playoffs in 2017 despite a negative point differential. The Buccaneers haven't reached the playoffs since 2007 and they've had a few false starts in turning it around. Finishing first in DVOA over the first four seasons of Russell Wilson's career was an extraordinary run for the Seahawks.